Schizophrenia (SZ) is a severe mental disorder with a lifetime prevalence of approximately 1%. Genetic factors are an important part of the aetiology and pathogenesis of SZ . In recent years, in genome-wide association studies, a single nucleotide polymorphism (SNP), rs12807809, in the NRGN gene was reportedly associated with SZ , and the T allele conferred a high risk for SZ. An association of rs12807809 with SZ was also found in 1005 SZ patients and 1069 controls in a South Indian population; further analysis found a moderate association of rs12807809 with flat affect and hallucinations . In addition, an expression quantitative trait loci (eQTL) analysis provided evidence for an increased risk for SZ with rs12807809 at a molecular level . Over the years, rs12807809 has been extensively studied; these studies have suggested that rs12807809 is associated with structural and functional abnormalities in the brain and symptom severity in SZ patients [5–10]. The NRGN gene is the human homologue of the rat RC3/Ng gene, which is localised to chromosome 11q24.2, spans approximately 12 kb and contains 4 exons and 3 introns . A 78-amino-acid protein is encoded by exon 1 and exon 2. Exon 3 and exon 4 comprise untranslated sequences. Moreover, intron 1 contains a thyroid hormone-responsive element . NRGN encodes a postsynaptic protein kinase C (PKC) substrate, which is expressed in the soma and dendrites of neurons in the hippocampus and striatum and in the cerebral cortex [13–16]. This protein is called neurogranin (Ng), given that its immunoreactivity is correlated with granule-like structures in hippocampal pyramidal cells in electron micrographs . The phosphorylation of Ng by PKC is activated by Ca2+, phospholipids, and diacylglycerol. In the absence of Ca2+, Ng binds to calmodulin (CaM), which also regulates neuromodulin. Moreover, the phosphorylation of Ng by PKC is inhibited by CaM . In the presence of Ca2+, the affinity of Ng binding to CaM is decreased. Ng is considered to regulate many postsynaptic signal transduction pathways due to the role of Ng in regulating Ca2+ and CaM. Ng knockout mice showed performance deficits in a spatial learning paradigm. In addition, Ng knockout mice exhibited changes in synaptic plasticity, which suggests the involvement of Ng in spatial learning and synaptic plasticity . Hippocampal dysfunction has also been associated with rs12807809. In a previous study with 112 healthy volunteers, a relative reduction in hippocampal activation was observed in rs12807809 TT homozygotes compared with that in C-carriers during the acquisition phase of a contextual fear paradigm . The hippocampus is a major component of the brain and plays important roles in learning and memory. Additionally, the hippocampus is the beginning and end of the Papez circuit  and an important component of the limbic system. Hippocampal dysfunction in SZ has been reported in previous magnetic resonance imaging (MRI) studies. Structural studies of SZ have shown abnormalities in hippocampal volume and shape [22–24]. Structural abnormalities in the hippocampal formation have also been reported in populations at a high risk for psychosis [25, 26], implicating genetic susceptibility in hippocampal structural alterations in SZ. 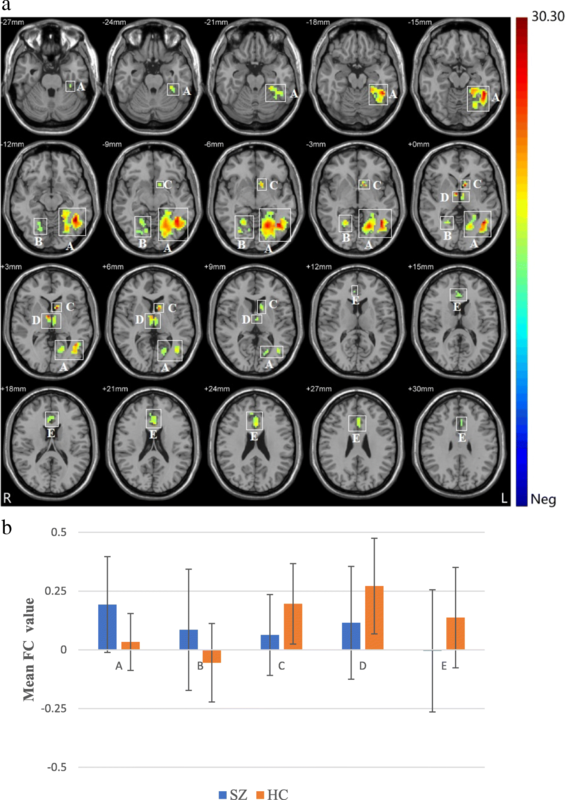 Additionally, resting-state functional MRI (fMRI) studies have reported increased hippocampal activation in individuals with SZ [27, 28]. Although no difference was found in hippocampal FC between genotype groups, the lowest FC between the hippocampus and anterior cingulate gyrus was observed in TT homozygotes with SZ compared to that in C-carriers with SZ and HC TT homozygotes. In SZ studies, Ohi and colleagues also reported reduced grey matter volume in the left anterior cingulate cortex in TT homozygotes compared to that in C-carriers . In addition, an fMRI study including 94 healthy participants showed stronger activation in the anterior cingulate cortex in TT homozygotes than in C-carriers during episodic memory encoding . NRGN has the potential to influence hippocampal plasticity, spatial learning and long-term potentiation. 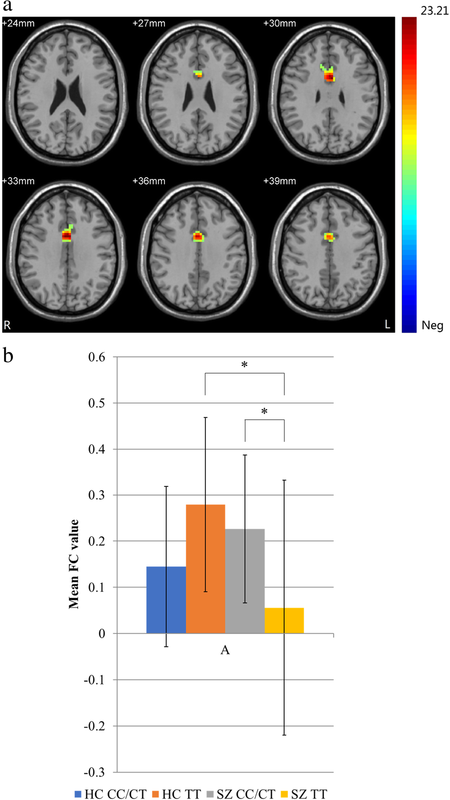 Moreover, the anterior cingulate cortex participates in both cognitive and emotional processing [43, 44]; this structure is mainly involved in the modulation of attention or executive functions, error detection, working memory, episodic memory, the regulation of emotional responses, and in the salience of emotional and motivational information [43–47]. Both the anterior cingulate cortex and hippocampus are parts of the Papez circuit and are involved in episodic memory encoding. Therefore, our finding of abnormal FC between the hippocampus and anterior cingulate cortex suggests that the T risk allele may influence the Papez circuit deficits observed in SZ.